where is the floor in the morning? She was special. All my students were, but she was especially special. I listened again this past week, via text, to the valleys that seem to stretch too long in her still-young life. I felt the too-familiar cringe curling my insides with the empty question, "Why?" This child - God's beloved child - walks every day a lone candle into a dark place. She has seen more messes in this life than I can count, but she is a candle all the same and her light shines on and dispells darkness. And I remembered. I wrote, "Where will you find the floor tomorrow morning?" She said, "right under my feet, beside my bed... everywhere I place my foot." It had come out in the middle of one of our 'pep talks,' sitting on furniture that had been rejected from all other offices. I don't remember the subject exactly, but I remember how it ended. I was asking this very special girl if there was anything to know for certain when the world swirled like crazy around her. I was asking her if she could be sure of anything at all inside the broken mess of her days. And that's when I asked, "When you get out of bed tomorrow morning, where will your feet land?" "...on the floor?" "And have you ever gotten out of bed in the morning to find the floor is gone?" "... Um, no." "God is like that. You are His child and He is forever. He will not change with the amount of mess or blessing in your life. He will always, always be what your faith and hope stand on - and He will not move." Our whole house can crumble around us, but there is always this ground - this terra firma where we walk out our existence. There is always this ground, a solid foundation for each shaky step. God is this foundation when the sunlight breaks through the window in the morning to shine on what was dark during the night. God is this foundation when the shadows scurry under beds and behind doors. God is this foundation when friendships dissolve and sadness overwhelms. God is this foundation when we swing our feet out of bed every morning. "Wow. You've got pretty great balance!" My cowboy boots had just come to a graceful rest at the end of a good, long slide across the snowy parking lot. Last night was the first real snow in Iowa that feels like winter and sliding with my boots just seemed appropriate. "It's really funny that you say that, because I actually fall down all the time," as I am saying this, I realize I probably enjoy the impressive feeling of staying on my feet a little too much. "Go ahead and get another good slide in," my friend said. I sealed my fate with a confident, "Yeah, okay!" I think my arms flailed, but I'm not sure. The next thing I knew, my cheek was touching snow. I laughed for awhile, thinking about how I must look to someone passing by. I could see my students in Honduras shaking their heads, "Oh, typico Nichols!" It's strange how familiar I am with these types of mishaps, but it doesn't make me want to slide on a snowy parking lot any less. After I got the giggles out, I decided I needed to get one more slide in - because what else is there in winter, but chances to shake with shivers and breathe out smoke and run with frozen lungs? What else in winter but a more urgent joy, bundled up in mittens and stuffed into shuffled steps? I wouldn't choose winter when I'm standing in August, but every snowy season I rediscover with wonder the urgent stillness; the thrill of goosebumps and every hair standing on end. And something whispers to my deepest place, "Hurry, before it wakes!" Running from frozen car to frozen door at work in the morning, facing near-Narnian winter winds, I can choose to relish the taste of winter. All this talk of winter is my re-visiting of a book I finished recently by N.D. Wilson, Notes from the Tilt-A-Whirl. If ever I'm tempted to shake my fist at the cold, unforgiving winter skies, I think back to Chapter 4. I think about all the treasures God has hidden in fast-moving moments today and about how I want to discover each one. If I let myself, I get excited about God's hidden treasures with the kind of abandon kids don't know how to cover up. I want to open my eyes extra wide today, at the chance I could take in more beauty. Living really does make dying worth it. I have a high tolerance for awkward. If I could knit some of my awkward stories together, you wouldn't believe the knotted mess of yarn I'd end up with - some very fantastical adventures, to be sure. My sister (who has a low tolerance for awkward) sometimes interrupts me mid-story because she doesn't even want to imagine the situations I find myself in. I finally found a word for it: gauche. It means, "lacking social experience or grace." In high school, I once pronounced genre, "jenner." Yep, I did. You might think the only way is up from there, but I've fought hard to stay gauche. It hasn't always been intentional, but the results bring laughter and I'm glad to throw in some deep-hearted bellows to the joyful mix. The other day, I couldn't even finish my sentence in a conversation with my boss that started out, "Earlier when I was trying to see how high I could high kick--" (laughter) "What? Is that weird?" I have believed for a long time the power such acts possess is unparalleled. Forget about the pressure of memorizing social cues. Trying to "say the right thing" always landed me far from the target, but with more embarrassment and less laughter. If I'm willing to be the most awkward in the room - to rediscover that childlike freedom, there's a good chance everyone else feels good about who they are and I get to laugh, too. I remember hanging out with my friend Sarah in Honduras and talking about how God can sanctify our personalities. We were wondering if, as we become more like Christ, our personalities would be less.... well, weird. I was mostly wondering if I would ever have less gaucheries in my days. If I would ever, you know, be less awkward. I was doing some acrobatics in her kitchen as we thought things through and while she endured my spider webs of words. Then, all of a sudden, I wondered if I could do the splits. Without any explanation, I disappeared behind her countertop. When I came back up, Sarah was full of giggles. "I just wondered if I could still do the splits," I said with a blank face. Through her giggles and gasps, she said, "I think your sanctified personality should have more splits, for sure!" And I think that's when I decided my very gauche life is quite alright. I'm thankful for those moments when I can see joy tugging at the corner of someone's mouth or when I see laughter dancing in the light of someone's eyes. I'm thankful for opportunities to throw life's glitter up in the air and see where it lands. That sounds very shiny and cute, like Lisa Frank stickers. But, I'm serious. Last night, my family shared around the dinner table, "a hope for this year." My hope was to get serious about joy. I'm 'bout to figure out what makes brown horizons and dark corners and sad eyes shine. The bold dawn has cast out the shadows of this day, this year, this sickness, this fear, this life. We are living the already, not yet life where dawn claims victory over the darkness of night in prelude to the Forever song. Today is a post-Easter, pre-Eternity day where we can rise up from the grave of death because in Christ it has no sting! Today, I'm praying my heart would come awake to God's heart. I'm praying my mind would come awake to the Word. I'm praying my actions would come awake in obedience and my life would come awake in Truth. I'm praying I will live 2012 awake, eyes wide open in search of blessings to name and receive and count and respond with a life of gratitude. May you all be blessed in 2012 with awakened hearts and minds, that you would pursue the Lord with everything in you, knowing that He will be found by you. let LOVE fly like cRaZy in 2012! There is snow falling in flaky clumps outside, freckling the brown ground. I couldn't call tonight dreary even if I stretched my imagination to its stretchiest state. The moments are delicious with laughter and Jasmine Green Tea and new things to puzzle. The blooms of poinsettias and the static-y, sticking up hair in the winter... the Mercury Villager that nearly ran me off the road on 13th street tonight and the whir of the washing machine... the smell of fresh coffee grounds and the safety offered by three comforters on my bed. Hm. I'm trying to make new habits - to count as blessings all things in my life. Inspired by Ann Voskamp and my close friend, I'm making thanksgiving a habit by living wide-eyed in search of life's gifts. A light that turns on by a switch, recycled paper grocery bags to wrap gifts, the welcome company of a dog I don't even like, a newspaper on the doorstep in the morning - all gifts, these. What is it that causes us to only count the big blessings? Why don't the little, menial details of this life qualify? It is sometimes truly the smallest of details that make up the biggest of blessings. Sometimes we assume our existence is inevitable. We forget that we are God's speech - walking, breathing, loving, and savoring sunlight. We are the physical fortitude of divinely penned, intricate poetry. N.D. Wilson's "Notes from a Tilt-A-Whirl" speaks about how silly our sense of entitlement appears when we realize we own nothing. We control nothing, yet we presume power. Are you too important to be amused at your own finitude? Are you unaware that your bowels move daily? How lofty are you? How lofty are you? Too lofty to admit you are limited? It's a good question, and not just for a Sunday School in lecture about being humble, obeying your parents, and doing your chores. It's way bigger and way smaller than that. Naming the symmetry of wooden cabinets as a gift is perfectly acceptable, because how is it that materials can be shaped as such? Am I above naming the small gifts? Am I above laughing at the whimsical things in this life that seem to only serve the purpose of God's divine humor? Am I too lofty to marvel at a delicious drink made from soaking leaves in hot water? Not that long ago, I felt the Lord leading me beside still waters and making me lie down in green pastures - a very literal slowing of my spirit and schedule. After a bit of a search, I took a position working at a church as an assistant in youth ministry. Today, I added two more employers to that list and now work in three completed unrelated fields (unless "customer service" covers all the bases). Christ was not too lofty for this life, not too lofty for this skin, not too good for long walks in the desert. Christ made Himself the lowliest when He came as a babe. Our Lord and Savior had daily bowel movements, too. If God can live inside this skin and still be holy, then there is much to rejoice about that is being forgotten - so many mysteries to have wide eyes to see. I intend to do just that, Lord willing. Rejoice in the Lord always, friends! Search Him and you will know Him, if you search with all your heart. I'm taking a crash course in living right now from one of the loveliest ladies I know. I'm following my textbook around as she lives and a more riveting account of a life you will not find. I've always been told the best classroom is life itself, but I've never learned quite like this. This living autobiography dabbles in comedy and tragedy, philosophy and religion, history and modern culture. I'm flipping through pages like crazy in these days and overwhelmed that what follows is always just as genuine as what came before. As we're climbing over rocks or talking with protestors on the street, she's not satisfied to accept an expected explanation. She's a digger and she doesn't stop until she hits gold, whether the topic is parties or pleasures or philosophies. And she doesn't make things up, either, to make the digging easier. She does her research until arriving at a conclusion that fits the weight of the question and then she holds that conclusion humbly. This girl's life is not full of roses and robust resolution, but it is authentic (in the innocent sense we lost when "authentic" became fashionable) and it is teaching me great Truths. Life is full of miracles. Currently I'm living in a miracle called, "God transforms a life." Who are some of your favorite teachers of life? Go a-visiting. Make frequent trips to visit neighbors, friends, and your siblings where they provide breakfast, lunch, and dinner and delightful conversation. I've found that people are not opposed to this one bit. They enjoy the interruption in routine and a reason to break out the cookies (or special recipe) they've been saving for an occasion of any sort. If you have got a knack for baking, maybe you could whip up something before you set out, that's sure to make someone's day! Get your give on. It's a great time to go through everything that has piled up with the promise of "getting to it someday" and then give it away! If you haven't used it in the past 6 months, do you REALLY need it? Could someone else need it more than you? I will admit my packrat tendencies and, even though I love giving things away, sometimes it's hard for me to part with things (see below). Go through collections of junior high love letters. I read one that said, "Hi, I like you and you probably know that by now. The problem is, I like 2 other girls and I have a girlfriend. But my girlfriend is going to break up with me (for good reasons) and you know I've liked _____ all my life! And the other girl won't talk to me but when we do hang out we just hold hands." and then the next note from the same boy said, "I don't know why you showed ________ the note. She was mad. Well, I guess me and _______ are mad at each other and we were supposed to fight. But, I guess we're friends again." Oh, junior high! Read. read. read. There is so much going on in the world and it is overwhelming even if you're reading the news non-stop. I like to mix things up a bit - news, commentary, theology, philosophy, comedy, fiction, autobiography and biography. Right now, I'm reading an 18th century theologian, the "Decline and Fall of the Roman Empire," and using my internet sleuthing abilities to stalk all kinds of blogs. The most important book you could ever pick up: the Bible. That's where the wisdom is at, without fail my friends! Start making Christmas gifts! I've been in my grandpa's woodshop - sawing, sanding, drawing and designing and I LOVE what it does for my heart! Spending TIME with people I love making GIFTS for people I love - priceless (and literally doesn't cost anything because I just scour my parents' farm for supplies! My brother just happened to get married recently and we used barnboards for decorations.... everyone on my list just might be getting a re-purposed barnboard for Christmas). I smell like sawdust after a couple hours and it makes me feel like I'm working hard to accomplish actions of love. Smells good. Do what you love doing... all day long. If it was me, I would write and/or hang out with kids and/or read. Guess what - being unemployed is technically a dream come true! I already have a computer, internet is free almost everywhere, I have a library of books I haven't read yet, and there are oodles of ways to make sure I've got kiddos in my life! Deliver pizzas or drive a tractor. If "unemployed" means you "can't find employment suitable to your expectations," then you most definitely need to make yourself useful in the meantime. Can you drive? Deliver pizzas (as Dave Ramsey would say). Or do what I did - drive a tractor. That's right. And if you live in a city, I'm sure there are some small businesses that might need extra hands around the holidays! There is absolutely no reason to ask the government to pay you a salary to sit on your couch. Sorry, there are just too many jobs posted for that to make sense. Get humble. It might hurt, but it's good for you (and me). Figure out the science of milk foam. The key is the milk has to go both up-and-down AND side-to-side. Those fancy machines are so expensive and boring and loud, but the alternative happens to be simple and interesting and very quiet. Just take a beater (one you would use in a hand mixer), heat a small juice glass of milk, and then roll the beater between your hands! Woila! Latté! People watch. Currently, there are some ladies playing a competitive rummy game to my left and a book club to my right (which also appears to be a strategic team to save a local library). I just love imagining what people are thinking or what they are headed home to after coffee. One lady who just left made all her personal/business calls sitting one table away from me. I feel like we're pretty close now. She has two kids and her oldest just recently joined a sports team, which she is really excited about. She is juggling night college classes with her work schedule and Black Friday might be a hard day. Cherish the slow moments. If there is one thing people like to tell you when you are unemployed, it's some version of, "Enjoy this time, because you'll wish you had when you are working full-time." I get it and I am trying. Complaining doesn't make me any more qualified, so I'm trying to keep that in mind. The sun shines just as bright on the employed as it does the unemployed (and we have a lot more time to think about it). Be oh-so-grateful for community. This is a serious one. I am part of that 9 percent, but I'm not part of the unemployment movement (can I say that?). I am not waiting and hoping and praying the government will feel responsible for my situation. I am depending on the Body of Christ and they haven't yet let me down. My friends and family have been so gracious to welcome me into their homes and their lives, showing me love I didn't ask for or deserve. I just got back from Honduras in June and I still haven't allowed myself to fully process what it means to live here now, but I know that there are people around me ready to support me in the process. My church family has been so encouraging, giving me job leads and networking contacts as well as odd jobs here and there. My parents have been amazing. Never, ever in my life did I think I would say, "Well, I'm 27 and living with my parents." The sound of it makes me grimace a little. But, can I say this is a uniquely United States discomfort? In other countries this is normal and doing anything else would be foolish. Apply. Did you think I would forget? Ha! I've applied for somewhere between 75-100 jobs from California to New York. I spend a little bit of each day either searching or applying or emailing. I talk to people who talk to people who know people who might have something and then I track them down. I've applied for jobs in advertising, agriculture, publishing, social work, higher education, and as an administrative assistant. I have had interviews and almost-interviews and people who tell me, "You are exactly what we are looking for, but we don't think this job would fulfill you." Really? Let's wait for paycheck one and let me decide. But, with every rejection (there've been many) and every cold call and every dead end, I know that God is not confused or frustrated. He is sovereign and He is good - all the time. I trust in His perfect plan and my place in it. If you want to make even this interesting, then you'll apply for some jobs with a bit of whimsy. I once sent this Cover Letter to an advertising agency with an ... interesting angle. Okay, folks. What additions do you have? I know there are oh-so-many things unemployed peeps can be doing with their time that might be more productive than camping out to make a statement that someone should give them more money. Well, yesterday was about as FINE as it could get! I spent the whole day laughing with and talking and listening and dreaming with a very special Honduran someone. She reminded me of all the reasons God filled me up to be poured out during my time in Honduras. It was amazing to introduce her to a few aunts and uncles and cousins and see her fit right in. She sensed right away our bond through Christ and His love and I'm so thankful! My family does an AMAZING job of showing love. I can't wait for the big thanksgiving extravaganza in a few weeks! This was ONE fine day - imagine what several will be like with friends and family gathered up to celebrate the many blessings we have! I will say it might be hard to transition to a new boss. I'm kind of partial to the one I have. That brings me to the subject of today's post. It's been awhile since I shared some wisdom from the field (and by that I mean literally from the cornfield in Iowa, if you haven't been following my posts), but don't think I've been twiddling my farmer thumbs. Nope, when I'm not writing about farming, I'm probably studying it (in the classroom-without-walls sort of way). Lately, I've realized something. And it is REAL important if you want your farming operation to run smoothly. I mean REAL important in the same way that I need coffee in the morning (just ask Eeyore - it's an absolute must). Here it is - the key to a healthy farmer. Are you ready? Well, first let's assume the farmer has his machinery and fields and bins and whatnot in order. Let's assume he's a good farmer (because Eeyore is, of course). I didn't say I was going to share the key to a good farmer (there are plenty of more qualified people who could tell you that). I said I'm going to tell you the key to a healthy farmer. I also don't mean a healthy diet - farmers, I've learned, have coolers packed with all sorts of good things to nibble on during the day. So, the key to a healthy farmer? I don't mean knock-knock jokes and I don't mean the blushing kind. I mean ... skipping versus trudging and smiling versus frowning and yes, the occasional innocently unknowledgeable (some would say blonde) remark. From my observation, the farmer can grow quite somber at times. His furrowed brows can get accustomed to a serious study of things and his jaw can set in a "and that's settled" sort of way. Not that a somber countenance is bad, but sometimes (a lot of times) it is healthy to have something to chuckle about (or someone). Let me give you a scenario. I've got to preface it by saying I prefer the 3 person rhythm. I know, I might sound like a fieldhand snob, but I really like how the harvest rolled in when it was Partner, Eeyore and I making decisions and jokes and (every once in awhile) mistakes. I liked how the radio would crackle with familiar voices and that I could rock out to music in the cab when no one was looking. I love visitors, too, because I can draw on the weeks of knowledge I've tried to store in my brain and show off my mad tractor skills. I especially like kid visitors because I like being a kid myself, which actually brings me around to my scenario. It was a day in the field that turned quite confusing for me. There was a lot of mumbling and grumbling and a somber shadow that hung unfortunately lower than the bright sunshine that I was trying to bask in from my front row seat in the cab. For the life of me, I could not figure out what everyone was so sad about. No one felt like mumbling and grumbling to me, so I had to take my best guess at where I should go and what I should do. Thankfully, I had a very lively tractor companion and we laughed. Oh! Did we laugh! I tried out a few funny accents while going on about his stinky feet and if he wasn't belted in, he would've been rolling on the ground. We hopped out of the tractor and saw all the somber faces and I still didn't understand one bit of it. I'm sure they were discussing something really serious and important. The next morning, when Partner, Eeyore and I got our rhythm back, I realized I was tense ... and quiet. Eeyore will forever blame it on a caffeine deficiency, but I think I just needed some time to readjust to the old rhythm. Eeyore kept coming over the radio, asking questions like, "How you doing over there, Caroline?" and "Are you awake?" and "None o' them yawns, now." That's when it all started to make sense (maybe that was after a Diet Coke was delivered). All those silly questions I ask and sorry attempts at humor and mistakes a seasoned professional would never make ... those don't fit inside the furrowed brow and set jaw countenance. And that is refreshing. Sometimes farmers don't want to talk about farming at all... and sometimes they want to talk about farming with someone who thinks every piece of information is new and interesting - like the first time you were introduced to silly putty or hot chocolate or the game of football. The first questions are always silly, and even the farmer can't keep a straight face while explaining. The farmer needs UNfarmerly things to talk about and laugh about and comment on. He needs someone that will take his mind off the weather, the price of corn, and decisions about upgrading his operation. Or, maybe, the farmer needs someone who will listen to all those things, try to say something smart, and then talk about something completely unrelated. Because, at the end of the day, farming isn't living... and we need people to remind us just what that is. I must preface this by saying I ran this post idea by Eeyore and all I got was a grunt... and then he said to Partner, "We're pretty serious 'round here all the time." They will definitely need to be wired in by radio - farmers aren't necessarily the most approachable comedians when it comes to appearance, but when you give 'em a radio they churn out the real charm. From the seat of a combine or tractor (the 20 ft. view, some say), the world makes sense. Things are divided into rows and bushels and pounds and yields, so the mind can wander into those clever little things that don't make sense at all. From that little throne in the little glass cab, the world is his soybean (and those are pretty glamorous right now, aren't they?). It's not just a radio you need (if you're thinking you could secretly tap a farmer's radio and air it during prime time to make a buck). No, you need time... like hours. You see, part of the farmer's charm (Eeyore's anyway) is that there's no rush. When he climbs the steps to his throne in the morning, he knows he'll be ruling all day long. So, he strings out his material... across about 8 hours. A joke here, a sarcastic remark there... it's good for the same reason a birthday is good - you wait and anticipate and then celebrate because it doesn't come around too often. If we're talking rain (as all farmers do), then it's more like a drip-drop then a flash flood. Eeyore: See, now they're startin' the game early on Saturday, so's them Hawkeyes can get to drinkin' earlier. Me: Really? You're just being mean ... Maybe I should go up there and teach the students something about healthy lifestyles... Eeyore: Well, I don't know that it'd make much difference. Me: You can lead a horse to water, but you can't make him drink. Eeyore: Well, with them I think it's the other way 'round. I'll admit, it took me until I was driving home to make sense of this clever turn of phrase... and then I had the AHA face right there by myself in my car, "Oooooh! I get it!" You see how he did that? He lured me in with something interesting and a bit vague, drew out a comment or two, and then went in for the slam-BANG finish. Impressive, folks. That's what that is. But, back to my point... it's the 3-5 exchange and then silence. No explanation, no resolution, just silence. If I'm in eyeshot of Eeyore, I'll see him slowly put the walkie-talkie back in its place and concentrate on the rows ahead. This is key. He'll be funny again when he's ready, but not before. I still haven't figured out how to make any money off this discovery. Eeyore is always bothering me to make money off my ideas, like this blog. He and Partner think they should be getting paid royalties because I'm using their stories. I said I didn't use their real names. "E'rbody knows," he says (I'll just let him think that this blog has that kind of reach). I told him I don't get any money from the blog. He thinks I should get sponsors so that I'm getting paid for the time I put in (you know, a ROI). I told him money doesn't make any sense to me and I don't care much for it. He said I better find someone who cares a little. One thing I do know, jokes aside, when that auger swings out over the empty rows of corn, I better be ready with that grain cart. Well, right as I was walking out the door this morning to the field, I got a call. To be honest, I couldn't quite understand it all, but I did get, "We've gotta work on the ... and we won't be up 'n runnin' right 'way this mornin' ... I don't know how long it'll be ... but I'll give ya a call." I'm kinda bummed. I had my lunch ready and my coffee almost in the travel mug. I'm more bummed because this is a perfect morning for harvesting. Clear skies, sunshine and a chance to break out some serious layers to shield off the winter-ish breeze. I guess I'm even more bummed thinking about Eeyore trying to figure out and fix the problem in time to tackle the rest of that 90 acres like we planned. On the flip side, I've got a little time to write. I've been farming by day and nannying by night, so I'm nearly worn out when I finally settle in. Yesterday was particularly stressful because Eeyore came over the radio, "Hey, Caroline? Why don'tcha follow me 'round ...I'm gonna outline this field and I'll dump 'long the other side there ... This'll be a real test of your driving skills ... I don't want you hitting corn, but I don't want you fallin' in the river either." On the radio I said, "Tests make me nervous!" In my mind I said, "WHAT ARE YOU TALKING ABOUT "TEST"? This whole thing has been a test and I'm not just talking about my emotional well-being after returning from a developing country to be rejected by countless jobs and still uncertain of my place in the world. I'm also talking about driving a tractor at all. Now you're telling me I've got to squeeze into a six row path with certain death on one side and certain employment death on the other? Of course, I went. And he wasn't kidding. I felt certain some of the corn was unfairly leaning out in my path and the steep ravine was unfairly jagged and unpredictable. With nothing short of near-hernia, I made it and felt pretty accomplished. This whole thing (being somewhat professionally stuck) could be a big conspiracy to keep me humble and I wouldn't be human if I wasn't fighting it. Speaking of conspiracies... when I'm not following Eeyore around in the tractor or cracking jokes with Partner, I'm either reading or writing or doodling or all three. I've already started writing/doodling my Advent Conspiracy list! If you don't know what Advent Conspiracy is, check out the video below. The idea is that Christmas ≠ consumerism, so our preparations should reflect that. If we give gifts of presence (time together), then what we treasure is each other and not just something in a box! I also try to make most of my gifts (which can get tricky for the boys in my family) and this year I have a new source - Pinterest. There are so many clever and crafty ideas - from baked goods to stuffed animals from old gloves! Anyway, apart from enjoying people more and tapping some of the creative genius we all try to ignore, we also save money by giving this way. The Advent Conspiracy suggests there are some really amazing things we can do with it! So, maybe it's a good conspiracy that I'm farming... and even that I'm able to take moments like right now to process ... and apply for yet another job. Well, this morning started out soggy, but I had "high apple pie in the sky-y-y hopes" for harvesting... and then I got to the "far north side of the field by the cow field" and walked the muddy way to the tractor. A couple hours after I got there, we had to pack up and leave because the rain seemed so persistent. So, I traded my cheese sandwich for grilled and my bottle of water for steaming coffee and my walkie talkie for a laptop and the firsthand farmer lingo for a secondhand re-telling. After my "10 things I learned in Iowa harvest" post spread around the family like fire, I realized if I target the Midwest audience, then my readership could explode! Not that I care about how many readers I have... it's just funny to me that I can write a blog pretty regularly and the biggest response I get is from my comical/embarrassing experience with Iowa farmers. First, the farmer (Eeyore as we call him) is not so sure his identity is as concealed as I promised. Within hours of my post, he came over the radio, "What's this Eeyore business?" and I responded, "I don't know, you tell me. I didn't put any names in there..." pause "Well, e'rbody's figured it out then..." Sometimes, I just giggle because I don't know what to say. So, just to make things clear - I have not given any names and the names that are given are changed to protect the innocent. That goes for "partner" too. If my descriptions match someone you know, it is only by coincidence. Second, I drove with my cousin (the third grader who is qualified for my job) and I'll be honest - I was nervous. I thought he'd get in there and push all the right buttons and drive circles around my anxious jerking. Well, turns out I can sleep a little better at night knowing that he's not quite ready to take over. Today, I am proud to announce I moved up in rank (of course I've made up 'ranks' so it feels like I'm getting promoted and if you're about to question it, don't - it was my birthday last week). That's right. Today, I got to drive another tractor and it was different in every way. The transmission was a gear shifter, the buttons were all in different places. There was A - F and then 1-2-3-4 in each letter. The clutch is essential is this machine and oh! I forgot to mention that there is a very large obstruction in the form of loader arms right where I count the 5-6 rows out for on the go loading. I got a 5 minute tutorial from my partner and then off I went, picking up a load on the go. I haven't told Eeyore, but I'll expect a badge tomorrow. "Well, it's pretty rough in here... better unload there at th' end." Translation: You're good, but you're not that good. I'm not taking chances on your driving, but I want you to think the field is responsible. Me: "Sorry about that, I was SO close but SO far." Eeyore: "Close only counts in horse shoes and hand grenades." Me: "I'm not good at those either." Eeyore is waiting with auger out, ready to unload. Me: "We had to cut a tree..." Eeyore: "Cut it or pull it out at the roots?" Me: (Oh, crap) "Uh.. well, we cut it but pretty low down" Eeyore: "You gonna come back next year 'n cut it again?" Me: "Well, that sounds like pretty good job security I guess." Eeyore: "Sounds like a government job." Me: "That's why we're broke." Eeyore: "Yep." 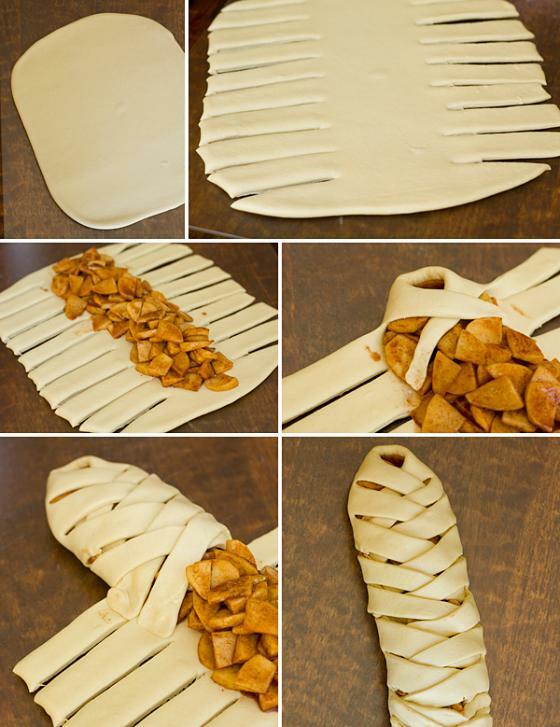 Well, I guess I might as well make an apple braid today. I've been wanting to try this recipe and today seems like the perfect opportunity to put some fresh Michigan apples to good use! And, yes. I will be cranking the Christmas music - I firmly believe there is NEVER a wrong time to sing "O come all ye faithful." I could title this, "everything I need to know in life I learned in harvest," but I don't want to get ahead of myself. knobs & levers - There are SO many knobs and levers inside a tractor these days! My mom always says that the minute I get into a new vehicle I have to pull everything at least once. Well, that was NOT an option. There were yellow knobs, warning knobs, green levers, buttons, and all sorts of graphics ... it's like a live version of a video game (and I'm not very good at those). Here's my trick - find the knobs I can touch (radio, throttle, speed, lights, seat adjustment, steering wheel, walkie talkie) and then push and pull like I know exactly what I'm doing. lingo - Yep. There is most definitely farmer lingo and even farmer-specific wit/humor. This makes me nervous. I'm such a communicator that I start sweating if someone gives directions I don't understand. "Swing round the south side 'n come up 'round the bend 'n I'll unload." The south side of where? which bend? are we unloading while moving or stopped? walkie-talkie - This is where the lingo happens. "Are you comin' up over the hill?" "What're ya tryin'a say? I'm old?" "Well, now that you mention it..." and then there was "Hey, did you finish up back there?" "Well, yeah there wasn't much there..." "I just wanted to make sure you didn't get lost" "I'm not that old, now... careful." direction - There's no way around it. When we're talking north road, south fence, and aiming east, I can't fake it. I used to call roads longways and sideways when I was little and that just doesn't cut it in the fields. on the go - If I get to do this I am both excited and nervous. It means I drive alongside the combine as it unloads the corn into my grain cart. It means I've got to stay the right distance (about 5 to 6 corn rows) away from the combine and the right speed (about 3.8). That's a LOT of pressure, but I always feel accomplished if I don't mess it up. It sure helps when you have a gracious boss. there's no bathroom - Well, you get the picture. yard lights - When it gets dark (like it did last night), my partner taught me to look around the horizon at the yard lights from the different homesteads to get oriented to where I was in the field. That was some handy advice right about 7:00 pm. food - Bring it because you might be out there for 8, 9, or 10 hours. That's right. Getting into that tractor is a COMMITMENT and you better bring your stores like you are hibernating or you'll have to call in reinforcement to bring you survival rations and water (Yes, I did have to do that). Eeyore syndrome - I can never tell if it's a good field or a bad field, good/bad yield, and good/bad weather, because the voice on the other end of the walkie talkie always sounds on the sad side. "So, are we getting a good yield in this field?" "Well, it's alright. Sure is dry today... this stuff is just so dry." and "Oh, we've only got that patch there left." "No, there's a whole other stretch 'round the back." And, of course, this is with (almost exactly) the tone you would expect if Eeyore himself was giving you the information. I've learned the farmer is just cryptic by nature... and that I should try to take note of important things (like beans should hit right at %13 moisture and that a combine head for corn is much different than for beans) and then just give my best Tigger to bounce the spirits up a bit. I'm going to go ahead and make an 11. the view - it's amazing almost all the time. The blue sky... the clouds... the fields of crazy colors... the sun setting... all from the view of about 20 feet up. When I was little, I was thrown around like a toy amongst the brothers and men in my family. I don't mean that in a bad way (because my mom would say I "asked for it" almost every time and I probably did). But let's just say it wasn't strange to walk into our living room to see me hanging upside down with my brothers' hands at my ankles. Now, I could incite trouble like any good tomboy could, but I wasn't one to give up once I got in the middle of it. So, even in that helpless upside-down-at-the-ankles state, I would be jerking and swinging and doing any kind of acrobatics to get free. And it was always when the boys got tired of the game that it was over - not when I accomplished something with all my thrashing. They would let me go (probably by the surprise release method) and then I'd catch my breath long enough to go at them again, sure that this time I could somehow swing an underdog victory. (Sigh). Right now feels a lot like upside-down-at-the-ankles. I realize I haven't written since those last days in Honduras and I can't quite decide if it's shock or pain or laziness or a dreadful combination of all three. I had all sorts of ideas about what life would look like back here in the States. I still have that tomboy-ish mischief in me that looks at trials and says, "Ha! You can't get me!" and then scampers off knowing full well that trial is a-comin' at full speed to pick me up by my ankles and shake all my independence out (oh, and every little bit of loose change). And that, folks, is exactly what happened. I was applying for jobs in those places, but I was also picking up the pieces of my stateside self - trying to figure out what it would mean to live in this skin - and I ended up back on the good ole family homestead thrashing and resisting the attack I provoked on my pride and independence. I am not one bit regretful of my galavanting, though. I'm kind of a face-to-face girl and I needed the time walking on beaches and sitting on couches and chasing kids around houses to remind myself that God has called me to let love fly just as crazy here. But, when the dust settled from the adventures and I started getting used to painfully pleasant rejection letters and emails, I started to feel the weight of "missing" the ministries and people and crowded streets and fried corn tortillas. It was sure heavy. God is so gracious to give me community in this time. I was ready to pack my bags and move almost the minute I got back, but He hasn't let me. No, I think I needed to get some thrashing out, upside down, before I could move on and He was gracious enough to let me do that in the midst of canning salsa and playing nertz and hiking timbers and harvesting soybeans. I am so very thankful. Last night, when I was babysitting some imaginative munchkins, I scooped up Dari and flipped her upside down and said, "I'm going to shake all your sillies out!" I shook and shook while she giggled until I said, "Well, I think I got 'em all!" to which she promptly responded by scooping all her sillies from the air and then touching my knees, saying, "Now all the sillies are in your knees!" I want so much to forget my days, for the joy in my heart! How wonderful a thing - to be SO AMAZINGLY FULL of joy that there is no room for anything else. So, I guess I'm back at this blog thing again. There is too much inspiration in this season to find excuses not to express it! The changing leaves, the baking spices, the conversations, and the endless times I find myself in the upside-down-by-the-ankles state ... they all want written about and I think I'll finally give in. Oh! The memories! I don't think it's a coincidence that 16 years later I ended up lost in a cloud forest on top of a mountain in Honduras singing that same song! That right there is proof positive that we store all those childhood lessons somewhere deep in our hearts where we will one day need to retrieve them. Right now is a 1 Peter 5:7 kind of time and (no matter how silly that man looks dressed like a book) I'm humming this tune as I live believing God is big enough to handle every last one of my cares. Not only that, but He takes my burdens and turns them into blessings. I'm praying something very simple over my students tonight... that they would have this kind of song etched deep in their hearts, so when they go away and get lost they will be able to reach down and find the only place to put their cares. Last night I either had a really bad, really realistic dream... or I had some serious digestive problems. I won't go into details (because you can still hope it was a dream) but apparently I got it all figured out in my sleep because I felt better this morning. Today was my long run day. I say that like I'm on some kind of "plan" or something and I'm not. But, I kind of make up my own "plan" based on what I read on Runner's World and how much my joints complain. It's not scientific or anything, but saying it's a "plan" makes it seem more official. Something I am realizing about 5 miles is that anything before 1 mile never feels awesome. I spend the first mile convincing myself running 5 is a good idea. Luckily, today I had Alistair Begg's incredible accent to accompany my steady stride. I'm listening to all the speakers from the recent Gospel Coalition conference in Chicago you can find all the audio for FREE here but if you wait, I'm sure there will be video as well. I am impatient and convinced I'll need to hear/see them twice anyway. I LOVE learning because it simultaneously expands my knowledge while giving me the distinct awareness that I know nothing! I know I'm not the only one thrilled about it either... so that makes me feel pretty good. So, I've been listening to Keller, Mohler, Begg, Carson, Piper, and the others who were gathered in Chicago to treasure the Gospel in the Old Testament together. I just wish I could process through some of it ... but I know God will provide those conversations in good time. I have some pretty ambitious goals for books this week - I am almost too scared to write them down for fear I won't finish. But, I will anyway: Competent to Counsel by Jay E. Adams, A King's Cross by Tim Keller, revisit Dug Down Deep by Josh Harris, revisit Calvin (A heart for devotion, doctrine, and doxology), and chip away a bit more at the excerpts from the writings of people who influenced C.S. Lewis. In addition, I'm going to crank out a newsletter - hopefully one that will have a special edition for the mission trip, which is a long time coming. I found the Jesus Storybook Bible read aloud recently and HAVE to share it! Seriously, take a minute to check it out and if you have kids, I'm sure they will love it. It's a great way to share the story of Jesus with them this season! and lastly, a strange tangent. Is the adage "less is more" really true? What if the whole world was edited to give a certain experience? Check out this article from a brand blog I've been reading lately. Today was a day that made living "a la orden" (see also here and here) a beautiful, precious gift! I sang a few songs at an all-school assembly this morning and then picked up a trumpet for a third. The band teacher, Dave, is pretty good about affirming gifts in other people... and when he found out I could play trumpet a few years ago, he hasn't let me forget it's a gift I should be sharing. And I can say I'm glad he hasn't! Then I had several conversations in my office where I said several times, "I'm going to be honest, okay?" and I just got down to the nitty gritty and it was completely received on the other end. Lately, I've been asking for recommendation letters from colleagues and several of them mentioned my abilities to meet students where they are. With that kind of affirmation, I've got to make it available... and when I do, it's like EVERYBODY wins! I'm using my gifts (God-given), students are getting blessed, and God is getting the glory! So then, there's this other ability people have pointed out called "you're crazy!" ..... Don't laugh! I really do think it's a gift!! I get SO much energy when people revel in joy. It's CONTAGIOUS. Anyway, people call it different things, "ability to relate," "crazy," "energetic," "young" ... and, well, I've got to use that gift to the glory of the Lord, right? Because it's only him that's allowed me to be so willing (at the cost of awkwardness and embarrassment) to go all out in search of joy! Tonight we did just that. Our plans changed a zillion times, but the mission trip kids (after riding down the mountain in the back of a truck) ended up in the mall doing a scavenger hunt of my devising. We arrived out of breath and sweaty at our final destination with hilarious stories and pictures to share. I LOVE IT. I seriously LOVE being available and not because I feel so important, but because I know anything good in me is the Lord. Anything I have worth sharing is the Lord's ... I am not my own! And when I share the gifts He's given, I receive SUCH JOY and blessing to see Him at work! Today is a day for rejoicing! In terms of routine and calendar, we were a bit early to be blaring "Because He Lives" from our trumpets this morning at the all-school assembly. But in terms of the Truth of Christ's power over the grave we were every bit right on time. I love to proclaim with my whole heart God's victory over the grave because it is my victory as well. I am a conqueror and co-heir with Christ ... so I will be joyful in victory and joyfully available to share my gifts so that His victory over the grave might be boldly proclaimed! It's truly more blessed to give yourself away. Today marks the beginning of Semana Santa and I can't wait to see what other joys the Lord has in store!